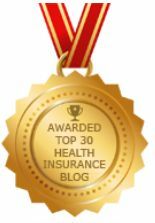 "Today [May 19th, 2011], The Department of Health and Human Services (HHS) issued a final regulation to ensure that large health insurance premium increases will be thoroughly reviewed... In 2011, this will mean rate increases of 10-percent or more must be reviewed by state or federal officials." "HHS has once again underestimated the intelligence of the American public ... The increase to premiums year over year, and over many years, tracks exactly with the increase in the cost of medical benefits paid." That is, he offers proof of our oft-repeated claim that the increasing cost of health care drives the increasing cost of health insurance. I think he's right, but I think there's another point here that's gone unremarked. Some of us are old enough to remember the early 70's, when gasoline became subject to price controls. The result was, at first, longer lines at the pump, and eventually rationing (ie you could fill up only every other day). Health insurance companies can't ration health care, of course, but they certainly can ration health insurance. I've already noticed a significant tightening in underwriting, and much higher than "normal" rate increases (particularly in small group). To illustrate this point, imagine that Washington imposes strict new safety and efficiency requirements on automobile manufacturers, and then limits how much they can charge for new cars. Does this make any sense? But that's exactly what's happening with health insurance: new mandated benefits, and a cap on how much more insurers can charge for providing them. There are two points to be made here. First, as regards McCarran-Ferguson, why aren't state DOI's asserting their jurisdiction over rate increases? Why have they ceded that function to HHS and the minions of Secretary Shecantbeserious? Second, it's apparently not just legacy media types who don't "get" simple, basic economic principles. The one in operation here is supply and demand: when you add "freebies" to insurance policies (routine exams, mammograms and colonoscopies, to name a few), people will go get them. Problem is, there are only so many providers, which means that there will be waiting lines and higher costs. Of course, Ms Shecantbeserious (as well as Barry, Harry and Nancy) would probably view those as features, not bugs. Is Obamacare actually reducing the cost of health insurance and health care? The short answer is no, and it never will. The folks at Consumer Reports fielded this question and fumbled miserably. Rather than actually reporting, they took the short route and repeated political rhetoric and theories from the talking heads in the lame stream media. CR cited these as reasons for hope and change in health insurance pricing. Unchecked increases in premiums, record insurance company profits, price transparency through imposed medical loss ratio's. Insurers are raising premiums on an as needed basis in order to remain profitable. 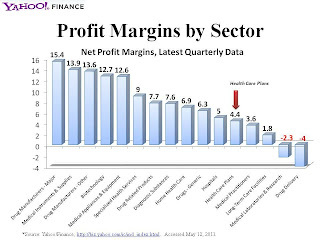 Profit margins on health insurance average about 4% on gross premiums. That means that every $100 in premiums paid yields about $4 in profit. If carriers had no profit there would not be a noticeable drop in premiums. Looked at another way, if carriers are not profitable they may lack the ability to pay claims which would be much more disastrous than making a nominal profit. The mandated medical loss ratio is a mixed bag. While some carriers may have had more margin than others on certain lines, the only thing that really mattered in a competitive market is how does their premium rates compare with others offering a similar plan? As someone who has worked in the health insurance industry for over 35 years I can tell you consumers are not stupid. They automatically gravitate toward the plan that appears to offer the best value. They could care less about loss ratio's, profit margins or CEO pay. As long as they get a "good deal" the rest is superfluous. All this talk about price transparency is mostly political grandstanding and saber rattling. If the carrier is experiencing a loss, or anticipates a loss on a line of business they must either raise rates to a sustainable level or withdraw from the market. Blue Shield of California has already announced their intention to pull out of the under age 65 major medical market. This decision comes on the heels of other small carriers who have likewise folded and stopped writing new business. Over-regulation and micro-managing for the sake of winning votes means the consumer loses. When carriers stop offering product and the number of competitors in a market shrinks, prices rise and consumers lose. Obamacrap does nothing to make health care, or health insurance more affordable in spite of what politicians and misinformed reporters may say. At its heart, insurance is a risk management tool. Whether that risk is loss of income, or damage to a vehicle, or the loss of one's life, insurance is a way to mitigate a risk. One risk that business owners face is the loss of their personal assets. Say you own Acme Widgets, a small C-Corporation that's looking to expand. One financial option open to you is a line of credit, but the bank wants you to sign for it with your personal signature, not just as the President of Acme Widgets. On the one hand, you really need the money; on the other, now your own personal assets are on the line. 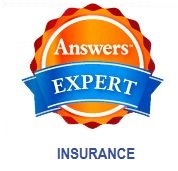 Well, Asterisk Insurance may have the answer: Personal Guarantee Insurance (PGI). What PGI does is to "cover a substantial portion of all guarantors’ net liability to a lender if the underlying business should be unable to repay its bank loan." You can actually cover up to 70% of that risk (which makes sense: any more and you run into moral hazard). It's pretty simple: if you have this coverage, and your business fails, the carrier will cover up to 70% of any shortfall, potentially saving a substantial amount of personal assets. The rate's determined by the amount of the loan and nature of the business, so it could be expensive. But for additional peace of mind, and the opportunity to save or expand one's business, it's a pretty cool new tool. Russell at Chatswood Moneyblog hosts next week's 5th Anniversary edition. Entries are due by Monday (the 31st). You know that old saying "take two aspirin and call me in the morning?" "Doctors are prescribing drinking water for neglected elderly patients to stop them dying of thirst in hospital." Apparently, some 800 (perhaps more) seniors die of dehydration in British hospitals every year. Another 300 are killed off die of malnutrition, ignored by hospital staff even as they (literally) starve to death. It's almost as if a nationalized system of health care uses some kind of "death panel" to help keep costs down. Good thing they weren't smokers. Turn on the TV, check out the movies, fire up Hulu, and you'll never find "The Exciting Adventures of [your name here], Insurance Agent." Sure, there was Banacek and Longstreet, but they were insurance investigators, not agents. Truth be told, there's generally little danger (or "real life" excitement) on my side of the desk; sure, it's exciting when that big case comes through, but that hardly makes for riveting television fodder. Even Evel Kneivel had hung up his pen and rate-book before his jump across the Grand Canyon. "A KYW Newsradio traffic reporter has died — murdered, police say, in a random attack over the weekend ... The 52-year-old from Waterford, Camden County was doing another of his jobs — selling insurance and checking on clients." According to his obituary, Charles Fricker was apparently quite the entrepreneur: DJ, radio traffic guru, and agent for the Continental Insurance Company. A full life, cut short way too soon. Health Affairs' Chris Fleming hosts this week's eclectic collection of interesting posts on health care policy. I really appreciate (and like) how it's organized: crisp and clear. We'll leave the obvious follow-up question ("should" it be?") for another time. "A Christian doctor in England has been threatened with an official warning from his professional body for discussing Jesus with a patient ... Richard Scott, a doctor for 28 years, is under investigation ... and faces disciplinary action after he suggested to a 24-year-old man that he might find solace in Christianity." Heaven forfend that a believer in some other Abrahamic faith should share harmless advice (and one wonders what Ezra Klein would counsel in that circumstance). The MVNHS© authorities have "written to Scott suggesting he accept an official warning." but the good doctor is having none of that. In fact, he's fighting back against what "he believes is a politically correct trend in Britain to persecute Christians for expressing their faith in the workplace." We wish him Godspeed in his efforts. "[MVNHS©] North Yorkshire and York are preventing certain operations for the obese and smokers because they say unhealthy lifestyles lower their chance of success ... Now the government is saying that although you've paid into the system throughout your life, unfortunately you will not be receiving treatment ... you are a second-class citizen because you smoke, drink or are obese." Now, one may argue that there are, or should be, consequences for one's lifestyle choices. But this is the very embodiment of Death Panels. Good luck with that "stiff upper lip" thing. Tax blogger Kay Bell switches gears a bit, and offers this round-up of ways we can help our devastated fellow citizens in Missouri, Kansas and Minnesota. One of ObamaCare©'s key features is the requirement that insurers cover routine, preventive care from dollar one. Of course, this increases premiums, but the trade-off, at least according to the "pass it to see what's in it" folks, would be well worth it. Many years ago, I had an enlightening conversation with a company rep. I posited that paying for (or at least counting towards the deductible) routine preventive care was a win-win for insurers: catching that breast cancer early meant reducing the risk of very expensive treatment later on, and insured's would have an incentive to be aware of their own health. The rep replied with what I still consider today to be one of the stupidest things I've ever heard from his ilk: "Well, you don't expect your car insurance to pay for tune-ups, do you?" Now Bob's made this point many, many times, and I agree with it: how much more expensive would your car insurance be if it covered tune-ups, oil changes, and tire rotation? But that's a far cry from the conclusion that a well-running car equals a safer driver. In the event, the train wreck was rammed down our throats passed, and so carriers are required to pay for routine screenings. "Robin Hanson posts some carefully conducted studies suggesting that certain cancer screenings don’t seem to have any effect on overall mortality. It’s not that they don’t work: The evidence says they catch cancers. They just don’t save lives." From that questionable premise, Ezra concludes that "if you want to control health-care costs, you somehow need to convince, incentivize or otherwise conscript doctors into doing it for you." In Ezra's world, "personal responsibility" is simply a non-starter: we should all abdicate our own judgment to the recommendations of our physicians. What's amusing about Ezra's little epiphany is that his premise - that increased access to health care increases the cost of that health care - is so, well, passe. After all, we've been making this point for nigh on 6 years. What took you so long, Ezzie? Wellpoint, parent of several large Blue Cross plans including Anthem, Empire and BCBSGA have announced a major change in the way they will compensate hospitals for care. Wellpoint companies operate in 14 states and cover 34 million people. In recent years, it has raised its payments to those hospitals by an average 8% a year. Under the new system, the company will pay increases only to hospitals that score high enough on a test based on 51 indicators of treatment quality. The indicators include whether the facility tries to prevent patients from relapsing after they leave the hospital, whether it follows a safety checklist and how satisfied the hospital’s patients say they are with their treatment. Facilities with poor scores won’t receive a payment boost. I believe the medical term for that is flatline. The WellPoint formula for measuring quality of care is based 55% on health outcomes, 35% on patient-safety measures and 10% on patient satisfaction. Real accountability. What a novel idea. Now if only taxpayers could do the same with government officials . . .
Dentists are refusing to treat patients with Medicaid and SCHIP due to low reimbursement rates. Patients paying cash or with private insurance don't have these same issues. Only those with "free" insurance courtesy of the taxpayer. children on Medicaid were 38 times more likely to be denied any appointment by dentists who were not enrolled in Medicaid and the Children's Health Insurance Program -- and were still 18 times more likely to be rejected by even those dentists who did accept Medicaid insurance. Why the prejudice against the publicly insured? The study authors cite a lot of potential reasons: "low fees, less patient compliance, negative attitudes toward beneficiaries, and administrative requirements being too burdensome. All of this may well be true, but consider this. Come 2014 when Obamacrap unwraps it is expected there will be some 20 million new enrollee's in Medicaid. Free insurance and no place to go. "Although not specifically mentioned by name in the rate review rules finalized last Thursday by the Department of Health and Human Services (HHS), the rule that exempts Medigap insurance providers is clearly designed to benefit the largest seller of such policies and the biggest lobbyist for ObamaCare — the American Association of Retired Persons." Bet you didn't know that AARP makes the bulk of its money not from its members (nominal) dues, but by its affiliation programs, including its line of Medigap plans. Remember, this is the organization that's fine with Death Panels, just not the death of its own cash cow. "Health insurers could avoid paying $3.4 million in rebates to customers if federal regulators allow Iowa to delay a component of health care legislation meant to curb insurance company profits and overhead." That's the Medical Loss Ratio requirement. "Six insurers pulled out of Iowa's individual health market last summer after [ObamaCare©] was passed ... State regulators fear that even more companies will leave." So the idea that ObamaCare© will increase competition, choice and availability seems to be circling the proverbial drain. Something which cannot be stated often enough is the breadth and depth of ObamaCare©'s job-killing nature. Health insurance is a big-ticket item for many (most?) small businesses, and it's about to get worse. In just a few short years, the new ObamaTaxes© come online; these will add upwards of $90 billion in additional excise taxes on insurers. Oh, wait: did I say "on insurers?" I meant "on thee and me:" insurers (like all businesses) don't pay taxes, they simply collect them from their customers. "Because these new fees are not tax-deductible for insurers, each additional premium dollar raised to pay the excise tax will face 35 cents in income taxes. So the true cost of the excise tax to insurers is nearly $135 billion. They'll therefore have to jack up prices by $1.54 to generate one buck for the excise tax. And in states with income or premium taxes of their own, insurers will face an ever steeper bill." Is there hope for change? A consortium of small business advocates thinks there is; they've put together a very useful website chronicling all the various taxes to which their members (and thus us consumers) will be subject. Called Stop The Hit, it's got a state-by-state breakdown of both the scheduled ObamaTaxes© and the percentage of small business-generated jobs. "One thing insurers and economists have agreed upon throughout the healthcare debate: new taxes on insurers inevitably means new costs passed along to customers. The group that experiences the most cost-shifting is the fully-insured market." "Costs of assisted-living care in Ohio are growing faster than the national average ... In Ohio, the annual cost of long-term care in an assisted-living facility is $39,900, and costs have risen 9 percent annually over the past six years. Nationally, the average cost is $39,135, with average yearly increases of 6 percent." Some perspective's called for here, of course. For one thing, Ohio's average cost is only about 2% higher than the national. For another, this means that the average daily cost for assisted living in the Buckeye State is just shy of $110 per day. Most agents I know recommend about $150 per day for Long Term Care insurance (LTCi). Oh, and one more thing: according to the article, the cost of nursing home care is somewhat lower in Ohio than nationally. Still, this underscores the need to at least consider a LTCi purchase, since that close to $40,000 per year cost can quickly eat up one's life savings. "Private long term care (LTC) insurance helps insureds with moderate disabilities stay in their homes longer and does not appear to crowd out informal caregiving." Most seniors I've spoken with would prefer to stay in their own homes, rather than face the upheaval involved in moving and downsizing. Obviously, someone in the throes of Alzheimer's may not have that choice, but for those with less serious conditions, having the means to stay in one's home seems like a good thing. On the other hand, the same study showed a disturbing phenomenon: "the researchers ... [identified] survey participants who believe they have LTC insurance but do not actually have it: Li and Jensen say confused consumers make typical LTC insurance penetration figures about 50% higher than they ought to be." Despite the Administration’s claims that Obamacare will reduce health care costs – and cover these Oklahomans and even more millions of America’s uninsured at the same time - we all know that can’t be done. Sure we know it. We’ve always known it. Many of us hoped it could be true. Some of us pretended it could be true. But we all knew it couldn’t be true if we thought about it at all. Similar Obamacare costs are going to hit every other state, too (although Nevada has received a statewide waiver. Why Nevada? Oh, c’mon, you know). So the additional cost was not unexpected. This puts the media in the awkward position now, of pretending surprise in the attempt to camouflage their credulous and incompetent reporting of the debate on health care and the uninsured during 2007 – 2010. Well then, why don’t we establish a federal medical insurance program for the poor? Oh, I forgot. There’s already a federal medical insurance program for the poor – it’s called Medicaid. And because the poor make up 65% of the uninsured, it’s clear Medicaid has failed to achieve its [sole] purpose. So then, wouldn’t it make sense just to fix Medicaid? Not the way the federales see it. Main reason - a lot of public attention focused on a failed federal program would have been unacceptable, just when the federales had determined to launch a new and even bigger federal program. So the remedy could not be to fix Medicaid. No, these are federales at work, and our federales don’t fix no stinkin’ programs! Just “fixing” Medicaid would have wasted this crisis of the uninsured. The remedy must therefore be a massive, grotesquely expanded, and horrifically expensive NEW federal program whose ultimate aim is . . . whatever . . . or something, just so long as it’s enabled by expanded federal powers regardless of Constitutionality and, of course, incredible new taxing and spending authority. Besides - fixing Medicaid would require enrolling the millions of the uninsured poor into Medicaid anyway, about half of which the states fund directly. So Oklahoma and the other states (not Nevada) face much higher medical insurance costs for their indigent populations, no matter what anyone calls it – Medicaid or Obamacare. And Obamacare has the advantage of investing so much more power with the federales. This crisis was definitely not wasted. And no one can be surprised to learn who is going to pay for it all, either. Five months ago, we reported on the bizarre tale of Life Partners (LP), "a fast-growing company in Waco, Texas, [which] has made large fees from its life-insurance transactions." There were a number of problems in LP's business model, not the least of which was their on-call oncologist of dubious reputation, and the apparent lack of transparency on the part of the founding "Partner." "Life Partners Holdings Inc., which buys life-insurance policies at a discount and sells shares to investors, said Friday that it could face civil charges stemming from a federal investigation into how it forecasts the insured's life expectancy." It seems safe to say that receiving notice that one's company is the target of an SEC investigation, not to mention a potential civil suit, ranks right up there with arriving at the office and finding the "60 Minutes" crew waiting patiently on the stoop. There's little question that the concept behind LP's business is valuable: look at how many carriers now include an Accelerated Death Benefit with newly-issued policies. The problem is that companies like LP seem to be taking advantage of both the insured and the (prospective) investor. As my father used to say, "bulls make money, and bears make money, but pigs go to market." In case you were wondering, it was never about compassion for "those left behind." It is not, and never has been, the responsibility of a life insurer to track its insureds. If you move, then you darned well better let folks ... where you're headed." We opined at the time that "the state does not, in fact, care about whether or not the rightful beneficiary benefits, just that the state itself gets (at least) a cut." Does anyone seriously think the state cares one whit about beneficiaries? Of course not: this is simply another means of extracting unearned dollars for financially-strapped state governments. It's shameful, unjustifiable, and a waste of resources. Not that I have any strong feelings on the subject, of course. The Wall Street Journal had an interesting article the other day about risk management and vacation planning. With travel costs at an all-time high, it pays to ensure (and, perhaps, insure) that your hard-earned dollars aren't wasted. We covered trip interruption and cancellation policies last year, and this new WSJ piece does a good job of exploring some of the "loop-holes" through which the folks who issue these policies can avoid paying out claims. They recommend "cancel for any reason" plans as the ones most likely to actually "pay off" if your trip is canceled or is cut short. Which brings us to the other side of the visa: travel medical insurance. Many health insurance plans (and Medicare) "stop at the border." So it's important to make sure whether or not your plan will cover you on the high seas, or overseas (or in Toronto or Cancun, for that matter). One thing that most "regular" plans may lack is emergency medical evacuation coverage; these claims can mean big bucks out of your pocket. The article notes that "for less than what you pay through airlines, you can buy an independent policy with $50,000 medical and dental coverage and $250,000 or more in evacuation coverage." While we're not necessarily recommending that much coverage, it's comforting to know that it's available. If you're planning a major (ie expensive) trip any time soon, our own Bob Vineyard may be able to help. He's set up a helpful site with plenty of options, including some for groups traveling together, exchange students, even folks going on safari. Very cool. "ENTIRE State of Nevada Scores Obamacare Waiver"
Just two days ago, Bob noted that SanFranNan had scored 20% of the latest ObamaWaiver©s for her district. He wisely observed that "we have to pass the waivers in order to know what is in them." "The Health and Human Services Department announced late Friday that Nevada had secured a statewide waiver from certain implementation requirements of the Obama administration's health care law, because forcing them through, the department found, "may lead to the destabilization of the individual market." At issue is the new Medical Loss Ratio rules which (among other things) dictate the percentage of premiums collected that must be paid out. It appears that (current) Senate Majority Leader Harry Reid's home state just dodged a major bullet. One is tempted to ask, of course, why he was so gung-ho for ObamaCare© in the first place, since he must have known, from a simple reading of the bill, that this was in it. He did read the bill, right? UPDATE: Not to put too fine a point on it, but it seems that Harry, Nancy and Barry have replaced Santa, the Tooth Fairy and the Easter Bunny in terms of largesse. Last week, a good friend and colleague called to ask for help on what had become a rather complicated case. His clients, a husband and wife, were about to lose their health insurance - through no fault of their own - and had asked him for help. While he dabbles in this area, he's really a (very, very good) P&C guy, and turned to me for advice. Bill and Mary are in their sixties (he's 68, she's 61). Bill was recently (May 3rd) laid off from his long-time job, in anticipation of the company closing its doors. He'd received his COBRA election info, but was unsure of his next step. He called my friend, who then called me. Bill's going to be okay: he can (and will) pick up a Medicare Supplement plan, as well as his Part D coverage, on the "open market." But Mary has a problem: after a thorough pre-screen, we've determined that she's uninsurable. You're probably thinking "okay, Henry, what's the big deal? They've got the COBRA info, she'll just glom onto that." In its infinite wisdom, the CongressCritters who drafted the Consolidated Omnibus Budget Reconciliation Act made it very clear that COBRA was a continuation of one's existing group coverage. Implicit in that definition is a major problem: if there's no group, then there's no continuation of that coverage, and so there's no insurance. The ObamaPool© plan has decent benefits, reasonably decent rates, is Guaranteed Issue, and will cover her (numerous) pre-existing conditions. She'll have to be uninsured for (at least) six months before she's eligible. That's correct: she and Bill have played by the rules, staying insured even when times were tough, and she can't access the same coverage that her no-goodnik neighbor - who's never bothered to buy insurance, even though she could well afford it - is free to waltz in this afternoon and buy with basically a signature and a (smallish) check. This is outrageous. Unconscionable. Immoral. We are punishing people for playing by the rules, for being responsible, productive citizens, for taking personal responsibility This isn't about politics, it's about something far more important: justice. The Fresh Air Fund provides free summer vacations to New York City children from low-income communities. Every year, some 10,000 kids benefit from this opportunity. In its over 130 years of service, the FAF has provided almost 2 million youngsters with access to unique programs and, of course, fresh air. The Fund's Sara Wilson tells us that they're "in need of host families for this summer. Host families are volunteers who open their hearts and homes to children from the city to give them a Fresh Air experience that can change lives." Sara's put together a really useful "microsite" that explains the program and how you (or someone you know) can help. Just click here to be whisked away to fresh air and a chance to help those less fortunate. For singles, the max you can drop in will be $3,100 (up $50 from this year); for families, it's $6,250 (up $100). Remember, you need to be covered by a qualifying High Deductible Health Plan (HDHP) to make contributions. The 2012 minimum deductible for these plans remain at the 2011 level ($1,200 for singles, and $2,400 for families). Some HDHP's include additional out-of-pocket requirements above the deductible (I hate these). These will increase $100 for singles and $200 for family coverage next year. ■ FlexBank's Lou Gellenbeck sent along this helpful info on how ObamaCare©'s new W-2 reporting requirements affect Health Reimbursement Arrangements (HRAs). The key take-away is that they're "exempt from the new W-2 reporting requirements for group health plans." But what's that really mean? Aggregate reportable cost does not include amounts contributed to a Health Savings Account (HSA), the amount of any employee salary reduction election to a health Flexible Spending Account (FSA), or the cost of coverage under a Health Reimbursement Arrangement (HRA). This reporting will be for informational purposes only and will not affect tax liability. Specifically noted in the legislation is the requirement that employer contributions to a health FSA (i.e. matching contributions or where the employer seeds the health FSA with funds) must also be reported in certain situations. FlexBank's FSA clients will receive additional information on this part of the ruling in the near future under separate cover." See why one's choice of administrator for these kinds of plans are local and accountable? Did your admin alert you to these changes? She also reminds us that "comprehensive guidance on the W-2 reporting requirement may be found here." Emily Holbrook makes her CavRisk hosting debut with this outstanding edition. It's short, sweet and right on point. Our good friend (and favorite TaxBlogger) Joe Kristan was recently quoted in the Wall Street Journal. The New York Times' Reed Abelson is a good writer, but (as with so many in the MSM), she seems unable to distinguish between "profits" and "profit margins." What's the diff, you ask? "ABC Widgets builds 100 widgets, and sells them for $1 each. First they have to buy the materials for about 60c, then assemble and market, for about 15c. Then they sell for $1 and give the govt 18c in taxes per widget. That means each widget costs 93c to make, leaving ABC with a 7c profit margin per widget. If they sell all 100, they make $7 in profit. Next year, material and assembly costs a little more, so they raise the price of the widgets to $1.50. Costs end up at $1.43, which leaves a profit margin of 7c again. But widgets are popular this year, so they sell 200! ABC Posts Record Profits of $14! Congress to investigate!" "The nation’s major health insurers are barreling into a third year of record profits ... 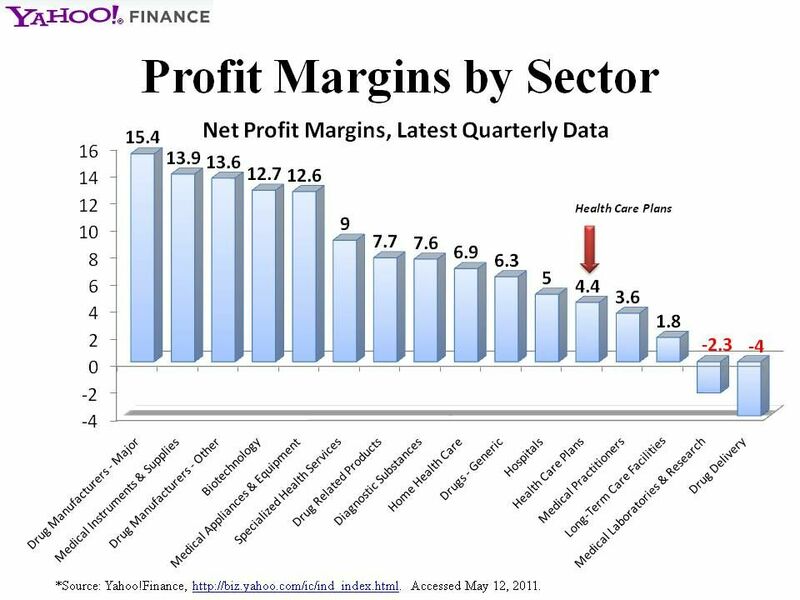 The nation’s major health insurers are barreling into a third year of record profits"
There's more, but that's the gist. The problem is that the cost of health care keeps increasing, and carriers can't go back and assess insureds (or previously insured folks) for their losses. They have to price for what may come, and there's no sign that the rising cost of health care delivery will abate any time soon (or at all). Still, one is tempted to say "that's all well and good, Henry, but these profiteers are making obscene amounts of money on the backs of their insureds." So they need to make a profit, and they have to decide the scope of that profit. So, another question: is 5% enough? 10? How much would you be willing to settle for? It's an important question because this chart, which our own Mike Feehan graciously sent along, shows exactly what other related players in the health care delivery and financing consider "reasonable:"
Is 4.4% a "reasonable" return on investment? In this economy, perhaps so (take a look at your 401 201k); but it's a fraction of that claimed by some others. As an aside: how long do you think doctors will settle for sub-2% returns? And what does that bode for future availability of health care? Now, if only the MSM would take a remedial econ class. Over the years, we've chronicled the precarious path on which the 45 year old program finds itself. The $64,000 Question is whether or not it's too late to change its course. Tony Bennett left his heart in San Francisco. Politicians leave Obamacrap waivers. Washington correspondent Jamie Dupree noted something curious about the latest round of waivers. Of the 221 new waivers a high percentage were in Ca-lee-forn-ya. The waivers went to hotels, restaurants and of course unions. As for the California angle on this latest batch of waivers, at times when I was trying to identify all of the groups that won a waiver, I almost thought I was doing research on a trip to the San Francisco Bay Area. It starts with the Blue & Gold Fleet, which takes people on cruises around San Francisco Bay. There was Cafe Mason, a restaurant in the Civic Center part of town. Still moving alphabetically, there was Campton Place, a luxury hotel in San Francisco; Compwest Insurance, a workers' compensation insurance provider not far from The Embarcadero; Emporio Rulli, a restaurant on Chestnut Street; there's even a listing for "Fillmore Street Restaurant" as well. There's the Franciscan Restaurant which gives you "Seafood Dining in the heart of Fishermans Wharf" and even a couple of places to stay like Hotel Fusion and Hotel Nikkio. Almost like taking a tour of popular spots for out of towners . . . or politicians. If you need a place to stay, there's Meridian Management Group, a company that in the San Francisco Bay Area that deals with apartment and commercial property rentals. If you need to find a place to buy things, there's Moor & South/Pier Management, which runs a 45 acre complex in San Francisco called PIER 39 with all kinds of specialty shops and restaurants. Back to food, there's North Beach Pizza, and if you need to find things, there is the travel guide to the city called "Only in San Francisco." Does this seem like a trend yet? Given that San Francisco is a popular tourist spot, maybe this waiver list is just a coincidence. Or maybe not. This closing comment raises some eyebrows. If I had the time, I would dig into all 1,372 of these waivers and see how many of them go to California, which delivered over 30 votes for the Obama Health law. It would make for an interesting story, especially it seems in San Francisco, which is the hometown of former Speaker and now House Democratic Leader Nancy Pelosi. Seems we have to pass the waivers in order to know what is in them. The venerable weekly collection of interesting medblog posts is hosted this week at the Prepared Patient blog. We've reported before on some unusual insurance policies, but here's something different: unusual insurance claims. FoIB David Law passes along this infographic of "Dodgy Insurance Claims:"
Naturally, something like this begs for vetting, so I first went to snopes for debunking. After poking around for a bit, and finding no related items, I was pretty well convinced that the list was legit. But I'm a belt-AND-suspenders kinda guy, so I grabbed a few of the items and Googled them. Sure enough, I found supporting cites for enough to satisfy even my cynical view. 1,372 Obamacrap waivers. Did you get yours? Is anyone going to be subject to this incredibly stupid law? The Obama administration approved 204 new waivers to Democrats' healthcare reform law over the past month, bringing the total to 1,372. Makes you wonder why this is never reported in the lame stream media. What are they afraid of? "The fact that over 1,000 waivers have been granted is a tacit admission that the healthcare law is fundamentally flawed,"
UPDATE: For those keeping score at home, here is a link to the lottery winners. The list includes 528 self funded plans, 457 HRA's, 315 MEWA's, 27 non Taft-Hartley plans, 39 carriers, 4 state mandated plans and 2 association plans. "Not surprisingly, it helps to be a Democratic ally when seeking a waiver ... Of the participants receiving waivers, more than half – over 1.55 million – are in union plans"
So the Obamastration is playing politics with its signature legislation? HBB's David Williams notes the irony (and arrogance) of Nature magazine's efforts to promote more patient advocacy - behind a $32 firewall. Speaking of social media, Jaan offers his Ten Commandments, er, Rules for health care organizations that want to tap into the power of Twitter, FaceBook and the like. Of course, Nature, Twitter amd FaceBook aren't the only new tech available to Health Wonkers: over at Pizaazz, Glen Laffel discusses how cloud computing is already impacting health care organizations. Glenn offers a case study of how one start-up was recently knocked for quite a loop. Do Medicare patients really have to wait longer to see their doc than those with commercial insurance? Our favorite health care economist, Jason Shafrin, has the (perhaps not surprising) answer to that question, and a handful more. Roy wonders why physicians are so reluctant to seek legal counsel before signing potentially career-ending contracts. So here's the question: is it really necessary for providers to fully implement EMR? To which Peggy has a simple answer ("Only If You Want To Get Paid") as well as some interesting alternative financing ideas. As usual, John's not afraid to tackle the big issues. In this post, he looks under the hood of Congressman Ryan's plan to reshape Medicare (with a special cameo from Diana Ross and the Supremes!). Another longtime HWR contributor, Louise reports on the underwhelming decrease in the number of covered lives in Colorado's small group health insurance market. Looks like Anthem Blue Cross is playing chicken with California's Insurance Department by raising rates even after being told not to. As ObamaCare© wends its way through the judicial system, Tim outlines the arguments in the 4th Circuit, focusing on whether the Act is even Constitutional. Known primarily for fine cheese and chocolate (and watches, of course), Switzerland may be an unlikely holder of the title "World’s Best Health Care System," but Avik effectively pleads the case. If Switzerland is the Best Health Care system (see above), then Massachusetts may be a leading contender for the opposite appellation. Jared points out that, in the Bay State, fewer doc's are accepting new patients, and existing ones are facing much longer wait times. Our own entry comes from co-blogger Bob Vineyard, channeling Cato's Mike Tanner and Dr Jane Orient, on why ObamaCare© spells big trouble if you actually need care. And that, dear readers, is that. 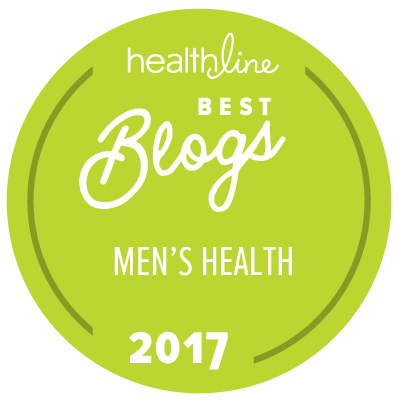 Please join us in a fortnight at the Health Affairs Blog, where Chris Fleming will host the next Health Wonk review. Emily at the Risk Management Monitor makes her CavRisk hosting debut next week. Entries are due by Monday (the 16th). "I want to look at whole life and term. If I am going to spend the money. I might as well get something for it. Otherwise it is just a monthly lottery ticket that you may die this month." Sometimes it takes our clients to most effectively articulate basic truths. In general, insurance is a one-sided contract: that is, the bulk of responsibilities (underwriting, paying claims, etc) rests with the carrier; the insured is tasked with paying premiums and not filing fraudulent claims. Oh, and not interfering with the carrier's ability to effectively adjudicate those claims. "When officials at Vienna Presbyterian Church decided to acknowledge the church's failures in handling reports of sexual abuse by a youth ministries director ... it wasn't the church's lapses in responding to the abuse a half-decade ago that bothered the insurer — it was the church's plan to admit those lapses and apologize to the victims." It's understandable that the church's directors would feel compelled to make amends, but in this case, it's not their money with which they're playing: it's the insurer's (and that insurer's other policyholders, who don't get a say in how VPC handles its errant employees). In short, be compassionate on your own nickel. I'm fortunate to have access to two recognized experts in this particular field. Bill M (whom we've met before) is an independent agent who does a lot of work with small businesses. Teresa S is the Commercial Lines Manager for the agency in which I toil. Both of them agreed with my basic take on the issues, and added their own perspectives. Bill sent me a copy of a typical "Minister's E&O" (Errors and Omissions) policy, which included "Duties in the Event of an Act, Error or Omission." He helpfully highlighted the clause specifying the insured's responsibility to "(a)ssist us, upon our request, in the enforcement of any right against any person or organizations which may be liable to the insured because of an act, error or omission." To put it another way, a doctor can't go on the local news bragging about how many sponges he's left inside patients as a prank and then expect his malpractice insurer to back him up. Teresa pointed out something else that VPC's elders seem to have missed: it's not just their congregants who were at risk (and who may have cause of action), but their guests. How many of these young women invited a friend to meet the "cool young minister?" And by "meet" I mean, well, there's the problem. Both noted that since no lawsuits have been filed (yet), the carrier can't really do much of anything except continue to insist that the church's leadership shut up, and continue documenting their refusal to do so. Once those lawsuits start flying, though, watch for the carrier to try it's best to deny coverage. I'll be on the sidelines, rooting them on. Seems HHS Secretary Sebelius has a "joystick" she can use to play God with the health insurance rules under Obamacrap. By moving her joystick ever so slightly she can cause small business group health insurance premiums to skyrocket. Bob Graboyes, Senior Healthcare Advisor at NFIB gave us a heads up on his post which is excerpted below. Secretary of the U.S. Department of Health and Human Services a joystick – the Essential Health Benefits package – with the potential to rocket small-business health insurance premiums skyward. EHB is the menu of goods and services that must be covered under all exchange-purchased insurance plans and non-grandfathered small-group and individual insurance plans. By vesting one set of hands with control over EHB, small business faces permanent administrative uncertainty. At the same time, the brunt of EHB appears largely to bypass big business, unions, and governments. So use the rules in a discretionary fashion to punish small business while allowing big companies, unions and government to skate. Beginning in 2014, PPACA (§1302) makes EHB a mandatory feature of most insurance plans purchased by America’s 6 million small businesses and 21 million self-employed individuals. Exceptions initially include businesses with more than 100 employees and those with grandfathered policies. The EHB requirements apply to policies purchased both in exchanges and in non-exchange small-group or individual markets. So not only small business health plans can be impacted, but individual health insurance plans as well. Unlike most state benefit and provider mandates, designing and altering the EHB package will require no legislative action. PPACA specifies simply that the Secretary of HHS “shall define the essential health benefits” after commissioning some data collection from the Labor Department. Even more amazing, is this power is wielded by someone who is not an elected official but rather is appointed by the president. Even if the current president and HHS Secretary are on the streets in 2013 who is to say the next HHS Secretary will be any more reasonable? What are “benefits typically covered?” Suppose 1/3 of the employers surveyed offer “Cadillac” coverage (high-end), while 1/3 offer what we can call “Corolla” coverage (middle-of-the-road), and 1/3 offer “Kia” coverage (bare-bones, but decent). Does the Secretary decide that since 2/3 of employers offer Corolla coverage or better, then that should define the EHB? Businesses with Cadillac or Corolla plans will be relatively unaffected. Only those companies with the Kia policies will see their premiums rise, and it’s likely that these will include many small businesses and perhaps especially start-ups. In other words, those hardest hit will be the incubators of America’s job growth. Very arbitrary and subjective application of the law. This is frightening. First, our condolences to the Miller family of British Columbia; Derek Miller, the blogger behind penmachine died last week of colorectal cancer. For once, this is not a post condemning CanuckCare©. Rather, it is a celebration of the life of a fellow blogger whom I never met; indeed, of a blog of which I'd never before heard. Turns out, Mr Miller (it just doesn't seem right to call him "Derek") spent quite a lot of time blogging about his own impending demise, chronicling the progression of the disease which would ultimately take his life. Rest in peace, Derek Miller. Baruch HaShem. Patients can have the doctor virtually diagnose skin lesions. They can learn how to lose weight using a calorie counter. And facts and figures on medications are right at Dr. Stone’s fingertips. Across Georgia, a growing number of patients are encountering doctors who have adopted electronic health records and other technologies — from smart phones and iPads to Web portals — to receive better coordinated care. Such accessibility is nice, but many wifi connections are not secure. What is the possibility of your PHI (personal health information) falling in to the wrong hands? The push toward electronic records is fueled, in part, by the new health care law that will encourage that providers receive payments based on results and patients’ overall health instead of reimbursing them for each visit or procedure. But setting up an electronic system can be especially daunting for small practices. A system can cost $30,000 to $50,000 — per doctor — and takes time and manpower. Ahh! Another of those Obamacrap rules that are supposed to make health care more affordable by raising the cost of physician services. Wonder if the docs are exempt from fines if your PHI is leaked, which is a HIPAA violation? Rome family physician Dr. Anne White, has found setting up her new system to be a challenge. White bought her first electronic record system in 2000 for $6,000. It was fairly basic, but there was no more running around the office searching for paper charts. But the process of transferring to a new system has been rife with problems. Many records didn’t transfer over. Data had to be re-entered by hand. White’s staff can look at charts from the old system but can’t print them. She hired two employees to help deal with the new system, and her practice manager spends much of his time troubleshooting IT problems. White bought the system early last year and estimates it could take another year to iron out all of the issues. And what if the software becomes obsolete like with her earlier system? How costly will it be to perform another upgrade? Change can be good but it is not without issues. Even with "grants" (of taxpayer money and Chinese federal dollars) I wonder how many of these systems will be able to communicate with Medicare? If your doctor's office cannot use the data to transmit to Medicare will your claims be paid on a timely basis?